With a variety of options and a definite contemporary edge, Firenza appeals to just about anyone looking to create an upscale, swanky ambiance in their kitchen. The next time you visit the kitchen section at your nearest home improvement store, take a look around. If your store is anything like mine, you’re bound to see the same trends over and over again. For many reasons, including the influx of DIY-related shows on cable television and sharing design ideas through online platforms like Pinterest and other social media, many of the kitchen trends we’re seeing are fairly redundant. That’s fine, of course. 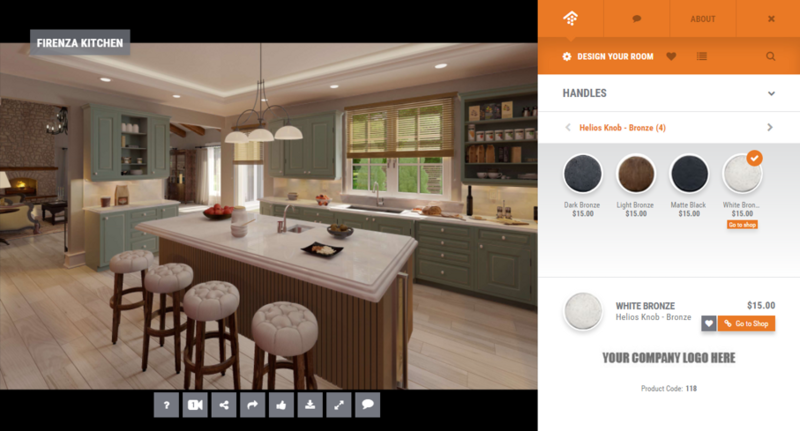 But if you’re looking for something a bit more unique and personalized, go ahead and try out the Firenza Kitchen Virtual Room on House Tipster. 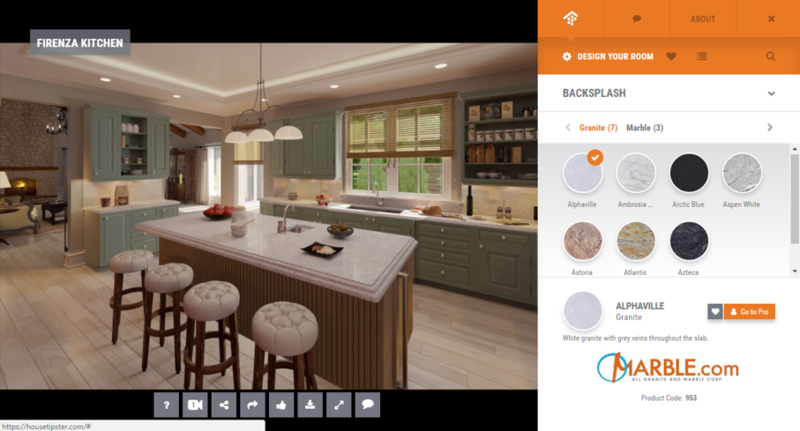 Utilizing state-of-the-art 3D virtual technology, you can completely personalize the room from top to bottom. Firenza is a magnificent room comprised of nine unique, totally customizable components. Plus, the L-shaped floorplan is prevalent in kitchens of every size across the U.S. and around the world. For a truly special kitchen designing experience, look no further than the Firenza Kitchen from House Tipster. At first glance, it’s obvious that Firenza is a well-appointed room. 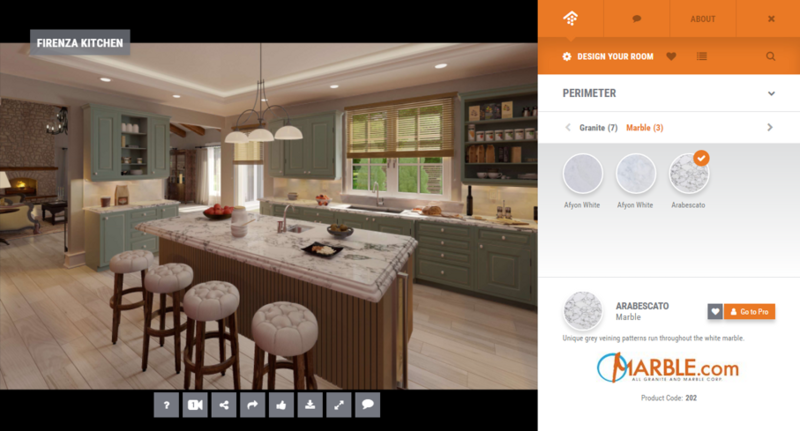 After I selected Firenza from the list of 10 possible virtual kitchens, I immediately noted the stark contrast of the bright luminous countertops and flooring against the dark, detailed cabinets. Now, this is definitely something that appeals to me! However, these Black Windsor Door Style cabinets weren’t the only element that tickled my fancy. I spent a few minutes and clicked on each of the 13 variants. Crimson was a solid option if I wanted to add extra life and energy to the room, something I’m always looking to do. But then again, there are a lot of cabinets in this room and all that red can easily become overwhelming if I’m not careful with the other room choices. To stay on the safe side, I settled on Vale Mist, the ideal combination of mint green and sky blue. 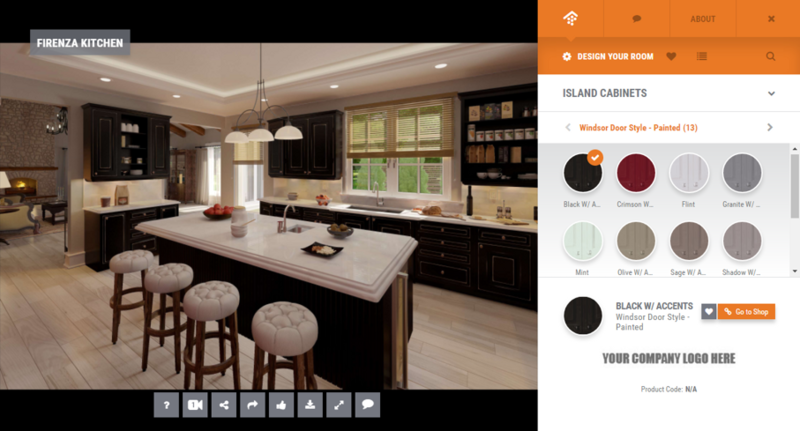 With Firenza, it’s possible to select a different color for the island cabinets. Instead of going with the Vale Mist again, I looked around and determined that Olive complemented the Vale Mist shade nicely. 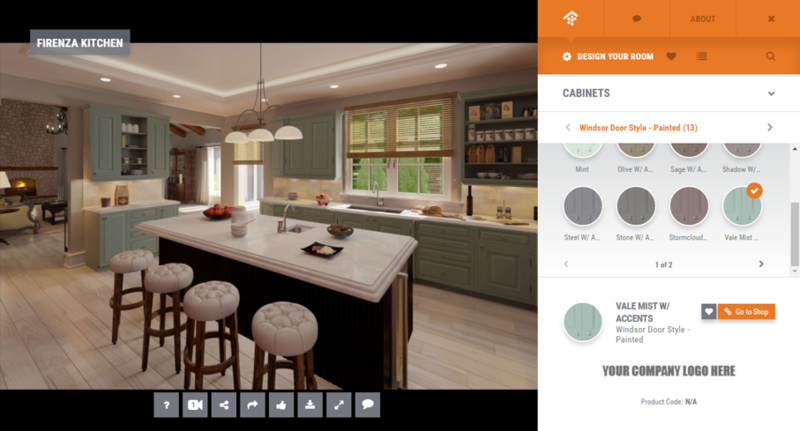 To finish the cabinet customization, I used the drop down menu to find “Handles.” Out of the four Helios Knobs, I was torn between dark bronze and white bronze. Indeed, both looked great against the cabinets, but the white really made the color of those cabinets pop. That’s settled then! By selecting “Island” and then “Perimeter” I was able to switch the countertop material and color to match the rest of my custom Firenza kitchen. The Afyon White Marble, the style that automatically appears with this Virtual Room, was smooth and definitely classic-looking. However, there are three marble and seven granite options that I needed to check out before settling on Afyon. Arabesco White looked promising from the drop down, but once I saw it against the cabinets I realized it wasn’t ideal for this particular color scheme. Since I fell in love with this material, I also used it as the kitchen backsplash. In a kitchen with multiple prominent colors like this one, wall paint matters! I’m a fan of Behr paints, and it always tends to match the swatches perfectly. The pink undertone of Clay Dust seemed like a good choice at first, but since there is so much gray in this room, this hue may have to go on the back-burner. Hazy Trail was my second favorite, and it had both green/mint and gray in the mix. This works for me! The flooring was the final big decision I made for the Firenza Virtual Room. Again, I genuinely loved the white ash hardwoods already populated in the room (called Carriage House) but when I selected on Vintage Java Bamboo, I realized that dark floors are a smart pick for this room. My Firenza kitchen turned out to be extremely attractive—it’s definitely a kitchen I would like to have in my house. Plus, the process of customizing it was a piece of cake! 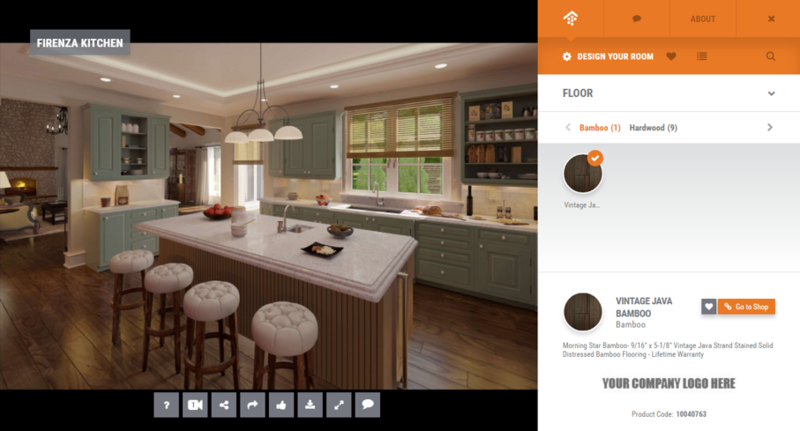 Go ahead and work with the Firenza Kitchen on HouseTipster.com. Then, tell me about your experience in the comments below. If your experience is anything like mine, you’ll be designing your dream kitchen in no time flat!